One of my favorite fantasy movies, Willow, will get the Blu-ray treatment for its 25th anniversary! Starring Warwick Davis (Harry Potter, Life’s Too Short) and Val Kilmer (Kiss Kiss, Bang Bang, Top Gun) and directed by Ron Howard (The da Vinci Code, Cocoon), it gollows the travels of the diminutive Nelwyn amateur wizard Willow Ufgood (Davis) as he tries to help the Daikini (human) baby Elora Danan fulfill a prophesy and defeat the evil Bavmorda (Jean Marsh, Upstairs, Downstairs). Check out the trailer and the the full details, which includes all sorts of extras including never before seen footage! Willow will be released on Blu-ray on March 12th, 2003. 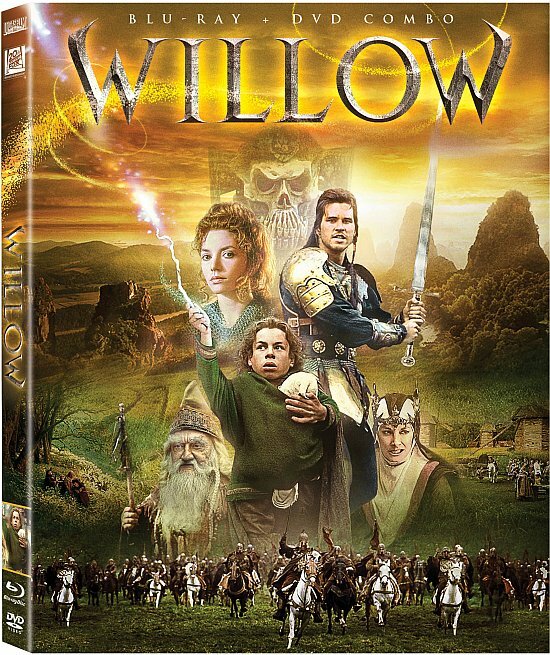 Journey to the far corners of your imagination with Willow, for the first time ever on stunning Blu-ray! Written and produced by George Lucas and directed by Ron Howard, the film tells a timeless fantasy tale in which heroes come in all sizes…and adventure is the greatest magic of all. In celebration of its 25th anniversary, the unforgettable classic has been fully digitally restored and debuts on Blu-ray and DVD Combo Pack March 12, 2013 from Lucasfilm Ltd. and Twentieth Century Fox Home Entertainment. Lucasfilm and related properties are trademarks and/or copyrights, in the United States and other countries, of Lucasfilm Ltd. and/or its affiliates. TM & © Lucasfilm Ltd. All rights reserved. All other trademarks and trade names are properties of their respective owners.